We created this cigar box guitar kit with one goal in mind - to make a kit that would allow anyone to build a real, playable cigar box guitar in about an hour at the kitchen table, with only the most basic tools (a screwdriver and small hammer). Here's "King of the Cigar Box Guitar" Shane Speal playing a Pure & Simple Cigar Box Guitar Kit he had finished just before recording this video. The entire build took him about 30 minutes. This kit contains all of the parts you need to complete your cigar box guitar - the box, neck, hardware and strings. Everything is pre-drilled and pre-marked, so that all you have to do is put in the screws, tap in the string ferrules, string it up and start playing. Don't believe us? Check out the full assembly guide here to see just how simple it is. Or check out the full step-by-step video below on how to build, string, tune, and play the Pure & Simple Cigar Box Guitar Kit. For the unfretted version we have pre-marked the hardwood neck with drawn fret lines to a 25-inch scale. We have also pre-notched the neck for the threaded rod nut, as well as the location of the special "Flying bridge". As an added bonus, we even include a slide! The fully fretted-neck version is also built to a 25-inch scale and uses a zero-fret nut for superior playability, especially for fingers that have never before played a guitar. 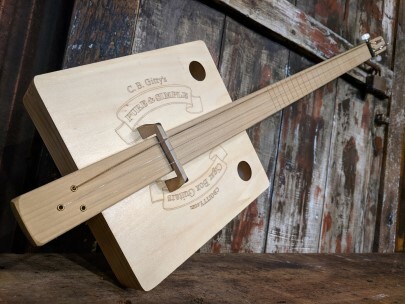 This kit builds the traditional "stick on top" cigar box guitar in the style of mountain dulcimers, where the neck rests on top of the box instead of running through it. The result is a nice, loud CBG tuned with the popular "Open G" tuning of G D G, which is what most of the Youtube how-to-play video presenters use. > One hardwood neck, pre-drilled , marked and prepped with all the necessary holes. The neck included with the fretted kit version has a 1/4-inch fretboard pre-mounted to the top of the neck. > One cigar box drilled with mounting holes and sound holes. Please note: box style may vary slightly from these pictures, but assembly steps will be the same. > Three guitar strings that you'll have singing in no time: .042-inch bronze wound (low G), .012-inch plain steel (high D), .009-inch plain steel (high G). Once you've finished building your guitar, you'll want to learn how to play it. For that purpose, you'll find the largest selection of cigar box guitar songbooks available here at C. B. Gitty. In addition, we also have the most comprehensive and eye-catching chord charts and posters around. And, of course, we have an enormous and growing library of lessons and downloadable cigar box guitar song sheets, all totally free in our knowledge-base, CigarBoxGuitar.com. With all these resources, you'll be playing your cigar box guitar in no time! We gave this kit a full test-run at a special charity event out in Los Angeles in mid-august 2014, and it was fun to watch the attendees, many of whom were Hollywood movers and shakers, putting these kits together and then carrying them around the event grounds. 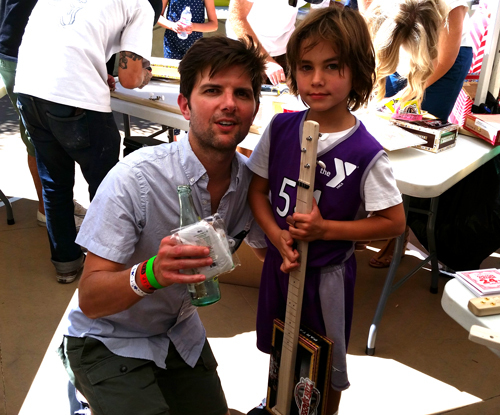 Check out the photo of TV actor Adam Scott (best known for his role on the hit series Parks & Recreation), holding the SECOND guitar he built with his son that day. As mentioned above, this kit contains all of the parts and materials you need to complete your guitar, with complete illustrated assembly instructions so that there is no guesswork or confusion. All you need is a screwdriver and hammer from your kitchen junk drawer. It just doesn't get any easier than this kit. The box also makes a great canvas to decorate (see listing Photos). Great for adding a personal touch! Adding a Pickup (Basic Piezo Harness) - This is a great way to electrify your cigar box guitar so it can be plugged into an amplifier. Installation is easy, but you do need to have some way to drill a hole in the side of your box. Check out this how-to-article, or watch this how-to video to see how to install the basic piezo harness. Adding a Digital Tuner - If you are new to musical instruments, you probably don't have a digital tuner. These are handy little devices that you clip onto the headstock of your guitar, and when you pluck a string it tells you what the tuning is. This guitar is meant to be tuned to G, D, G, so getting it to those exact pitches is made a LOT easier if you have a digital tuner. These tuners can also be used to tune most other instruments, including standard store-bought guitars, ukuleles, etc., so it is a useful thing to have if you intend to get further into music.